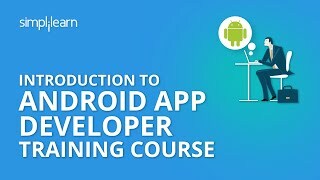 This Google-authorized android training course propels your career as a professional Android app developer. You’ll learn to set up the Android environment and master its architecture, including user interfaces, activities, controls, layouts, services, content providers, and multimedia APIs. You’ll gain practical development experience by building six top-trending applications during the Android app development course. Android developers are in high demand, so get certified today! This Google-authorized Android training will put you on the path to being a certified Android app developer. We’ll take you through the basics of Android Studio, the default integrated development environment (IDE) supported by Google to develop Android apps, including user interfaces, activities, controls, layouts, services, content providers, location, multimedia APIs. Then you’ll move on to more advanced concepts such as wireless connectivity, syncing to cloud, Android Wear App development, and Google Play. You will acquire the necessary skillsets and experience for professional Android application development by building six top-trending applications during the course. It is recommended that you have a good understanding of Java, or take the Java Essentials. What are the apps I'll develop during the course? Calculator: You’ll build a simple calculator app that performs basic calculator functions: addition, subtraction, multiplication, and division. Stop Watch: You’ll build a stopwatch app that is easy to use as a practical timer. Lil bird app (flappy bird clone): Lil bird is one of the most popular games in the mobile ecosystem, in which the player avoids obstacles by tapping the screen to make a bird fly. In this course, you’ll develop a clone of this game, upload it to the Google Play Store, and note the number downloads from users who want to play it on their smart devices. Android wear activity monitor app: With the growing demand for wearable devices, activity monitoring is expected to grow. You’ll learn to develop an Android app that monitors and records your activity. In this project, the goal is to connect with and read music content on a device and select the audio to play. Features should include the ability to pause the music and continue with new selection. You can log in to Simplilearn’s LMS for a detailed problem statement on this project. In this project, you’ll connect to a weather API and display the weather conditions for each of the specified localities. You can log in to Simplilearn’s LMS for a detailed problem statement on the project. How do I become a Certified Android App Developer? Will I receive a course completion certificate? To become a Certified Android App Developer, you must complete both the Android training program and the projects in the course. We award a course completion certificate after you successfully complete the Certified Android App Developer training program. A brief introduction to the projects are provided in the Learning Management System. You will complete both projects within the OSL (Online Self Learning) access period of the course and they will be evaluated by the lead trainer. You will receive a Project Experience Certificate from Simplilearn after you successfully complete the projects. Is there a certification exam for Android App Developers? Yes, the official certification exam for Android App Developers is called the "Associate Android Developer Exam" which is conducted by Google. This exam demonstrates the type of skill that a new Android Developer should have as they begin their career. By passing this exam and earning the Associate Android Developer Certification, you will show that you are competent and skilled in tasks that a developer typically performs. Simplilearn's comprehensive training prepares you for this certification exam. I came across Google’s "Code It Possible" program for the Indian Developers a month back. Being interested in mobile application development, I decided to check out the various e-learning websites that offered verified Google Courses.Simplilearn was one of the choices, and a quick Google search made me instantly go to their website and enroll in the Certified Android App Development Program. They offered videos along with Weekend batches with live instructor training. Having attended my first live session, it seems fair to say that my money didn’t go waste. The trainer and the TA were exceptional in their knowledge and the session was very informative. I do have some experience with Android since I’ve been learning on my own, and this course helped me learn faster and better. Overall, Simplilearn offers a wide range of courses covering a lot of technologies at a very affordable cost. They also have Master Courses which bundles two or more courses and reduces the total price. Thoroughly enjoyed the course! Excellent coverage by the trainer and constant support by T.A.! Very happy to have taken this course. The course covered majority important topics and helped me build applications very quickly with clear understanding. Prior to this course, I had a vague idea of app development but now I am confident and have published my app on Google Play Store. Thoroughly enjoyed the course! Excellent coverage by the trainer and constant support by T.A.! Very happy to have taken this course. The course covered majority important topics and helped me build applications very quickly with clear understanding. Every e-learning Certificate provided at Simplilearn is authorized by major training Providers. After a thorough research of all available e-learning providers, I found Simplilearn best for my Android Applications Development Certification. Following are few benefits at Simplilearn: 1. The online classroom Flexi-Pass to be the best offering. 2. High-Quality e-learning Content. 3. An extensive access to various other batches. 4. A trainee usually develops only 1 or 2 Projects, but with Simplilearn's best Industry Trainer's I developed 4 projects during the course and 2 at the end. 5. They have regular Project Monitoring sessions, which proved of great help at the time of project development. 6. Along with the Certification, they also provide an Experience Certificate for the projects developed. It helped me in improving my work profile as a beginner. 7. Last but not least, every certificate provided is valid across the Globe. I have registered for the Android App development course. My learning experience has been excellent. The instructors are very knowledgeable and helpful. The study material is also easy to understand and the video can be downloaded after every session. I strongly recommend Simplilearn. Courses offered by Simplilearn have been very helpful in keeping myself updated with the best practices in the industry. As the tag line says - my pace, my place. Video quality is good, simulation tests are very helpful to confirming the understanding. Consultants have been helpful in selecting the courses and making sure I get good discounts for new courses. People in the customer services team have been very helpful and been able to handle requests without much escalation. Thanks for a short extension to help me complete my session. Much appreciated! I feel among theOnline Certification Training Courses for Professionals, Simplilearn is the best institute available in India with flexible batches, timings and value for money. There are few key points which I would like to highlight about Simplilearn: - Simplilearn has highly experienced tutors and they have a thorough knowledge about Android App and development. - The online package is very affordable compared to other institutes, flexible in terms of timings and you can attend multiple batches (up to 3 nos.) with the same amount paid. - Audio and Video based e-learning content available for reference and are easy to understand. - Training recordings (Audio and Video) can be downloaded after each training class and can be used for future reference at any point of time. Thoroughly enjoyed the course! Excellent coverage by the trainer and constant support by T.A.! Very happy to have taken this course. The course covered the important topics and helped me build applications very quickly with clear understanding. The course taught me the fundamental concepts of Android Programming which has helped me immensely in my work as an App Developer. The training is really comprehensive and the On Demand Support team did a really good job at helping out whenever I got stuck. The 6 apps that I made as part of the course gave me the confidence to build apps and deploy them to Play Store, all on my own. Even now whenever I get stuck, I have the recorded sessions provided by Simplilearn, as a ready reference. Extremely satisfied with the training. Thanks Simplilearn! The training was crisp and I liked the topics on practical application of building an Android app. The course covers topics in depth and helped me get a strong hold on the fundamental concepts. I highly recommend this course. Content is informative and covers vital topics. I was fairly new to this field and yet I was able to grasp the basics with ease. The methodical approach to concepts and building an android app helped me to understand the process of app development. I am able to imbibe the learnings at work. This learning was instrumental in helping me to build a location based app. A lot of emphasis was given to the practical application and it helped me to watch out for these blocks and creatively develop a smooth working app. I am quite impressed with the flow of topics and I could revisit the previous content too. The detailed problem statement played a vital role in helping me developing the final app. You’ll need to know the basics of Java before taking this Android course. The Fundamentals of Java course is provided for free along with this course and will train you in Java fundamentals, giving you a strong foundation in professional Android application development. The following are the system requirements that will enable you to download the Android SDK (Software Development Kit) and Android Studio. On Mac OS, run Android Studio with Java Runtime Environment (JRE) 6 for optimized font rendering. You can then configure your project to use Java Development Kit (JDK) 6 or JDK 7. What modes of training are available for this course? You’ll be able to access your choice of Live Virtual Classroom or Online Classroom training. With instructor-led online classroom training, you’ll attend the course remotely from your desktop or laptop via video conferencing. This format enables you to attend from anywhere.